History and art combine to create a unique community artwork, on display from this week in Winsford town centre. The artwork is a small scale version of the steel artwork soon to go on permanent display in the newly transformed Town Park, reopening this year. Public artist Liam Hopkins from creative studio Lazerian ran a series of workshops at the Dingle Centre and Cross Hatch gallery in autumn 2017, with Winsford school children and adult community groups. 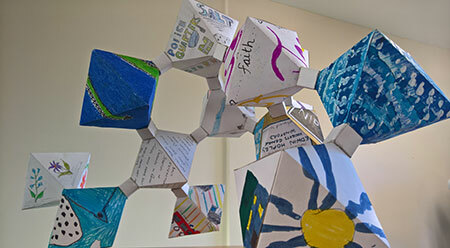 Each individual painted and drew images which represented their personal impressions of Winsford, and their creations were then linked together to make one geometric design. Liam said: “It was great to see all of the individual creations from the workshops coming together in one single piece of art. Paintings and drawings from the youngest person to the oldest displayed side-by-side all with one common theme – a love of Winsford. Winsford History Society helped the artist understand the town’s past and the significance of its salt industry. The permanent structures, to be named The Seven Sisters, are inspired by Winsford’s rich heritage. Consisting of eight structures, they reflect the multiple chimneys which dominated the Winsford skyline in the 1800s to 1900s. 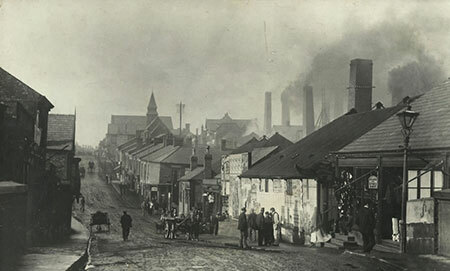 Hamlett salt works featured a series of chimneys nicknamed The Seven Sisters and the artworks have been designed to honour the impact the salt industry has had on the town. The community artwork is on display in the old Age Concern UK furniture shop in the town centre, currently called ‘Clearance Warehouse Factory Seconds’, from Wednesday 7th March. It will later move around the town as part of a tour, visiting the Wharton and town centre libraries before taking up a permanent home in Wyvern House. Town Park in Winsford is being transformed into an attractive space for everyone to enjoy due to a £900,000 investment by Cheshire West and Chester Council in partnership with Winsford Town Council. New facilities range from a children’s play area to wildlife ponds and exercise equipment.